According to Greg Rosenthal, Jacksonville Jaguars head coach Doug Marrone still wouldn’t commit to a starting quarterback after Thursday night’s game against the Carolina Panthers. Chad Henne got the start but the offense still had their struggles while Blake Bortles had an up-and-down night. Henne struggled with pressure against the Panthers, only completing one of his five attempts earning a passer rating of just 39.6 while also being sacked three times. In contrast, Bortles complete three of his four attempts under pressure for a passer rating of 104.2. 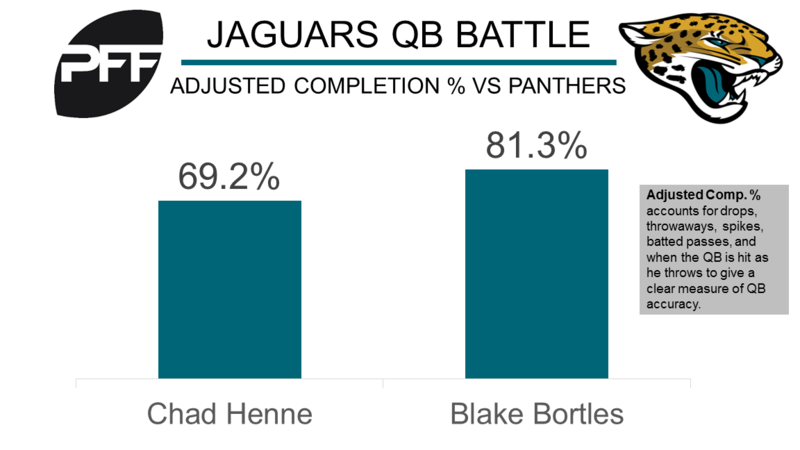 Bortles also had a higher adjusted completion percentage than Henne, completing 12 of his 16 attempts for an adjusted completion percentage of 81.3 percent compared to Henne’s adjusted completion percentage of 69.2%.